With the constant transformation in technology fueled by Artificial Intelligence, the customer experience has undergone great changes that are beyond imagination. Automation has taken over every task - ordering from dominos, booking flight and hotel or booking a lawyer's appointment. Undoubtedly, AI has dramatically changed the business demographics offering a viable channel to boost customer service like never before. Isn't it? Yes, of course! Well, we owe our thank to the new technologies “AI”. No one would have ever thought the computer will interact with a human in nature. However, the process was gradual and took a long time (nearly 10 years to make the personalized offering) to really get the things smartly going. The most common example of AI enabled technology is chatbots - leading the customer service industry towards ease as they understand the content and the context of the customer's requests and behavior. Watson instore innovative way to provide automated services to brand, from the conversational self-service experience to automated services, allowing real-time answers. And the beauty of using Watson is, brands have access to customize it fitting specific business needs. Apart from this, the deep analytics provide insights into customers’ engagement with chatbots and is really effective for brands in understanding customers’ varying requirement. 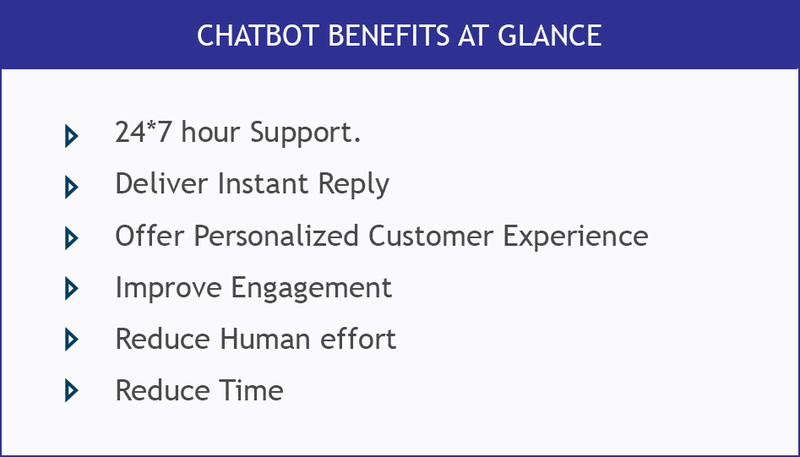 In a Research conducted by ChaiOne - a digital transformation agency explored how chatbots can bring value to businesses and the research was completely based on extensive customer service satisfaction. This research reveals the overall needs of customers and customer service providers to identify "how AI-powered chatbot technology will meet the requirement. With the continual practice of natural language processing, the chatbot applications have advanced and becoming powerful. 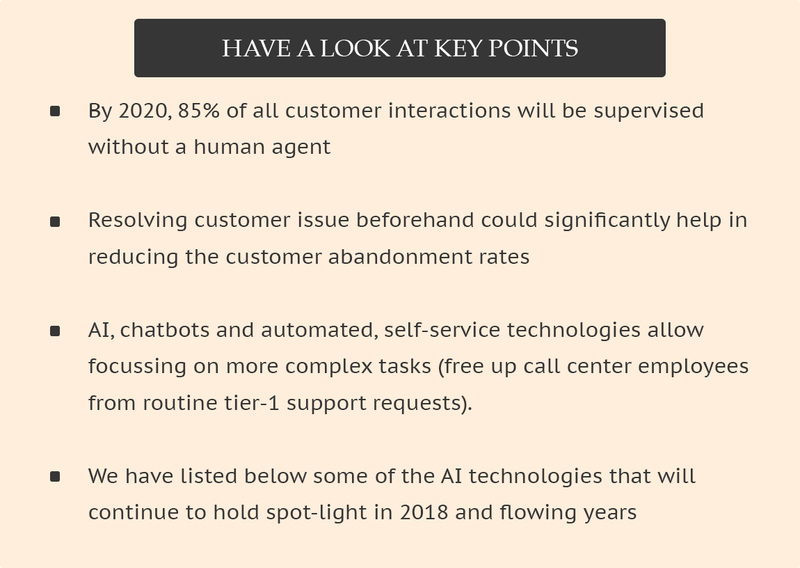 Today, most of the prominent companies and brands around the world are adopting AI bots to expand customer service representatives and provide customers with the solutions and answers they require spontaneously. Further stats unfolds that 80% of senior marketing and sales professionals expect to serve customers through chatbots by 2020. Again, number forecast that chatbots are estimated to save businesses $8 billion per year by 2022. Technologies like Voice recognition and Machine Vision has created a great difference, the way consumers explore and search for the product. This came in the market by smartphone VAs such as Siri and Google. It is further estimated that, By 2020, 50% of all searchers are predicted to be voice searches. Following some of the major improvements into smartphones integrating capabilities like machine vision and built-in AR capabilities, the visual search will set a high demand in 2018 trend. Hence, gradually, with time, search capabilities will advance, making searching and purchase streamlined and effective. The introduction of new technology aims at reaching and engaging customer offering a personalized experience. However, these applications rely on scalable personalized experience to leverage data. Well, companies like Netflix and Amazon have endeavored to offer customized messages, promotions and products directly to consumers. 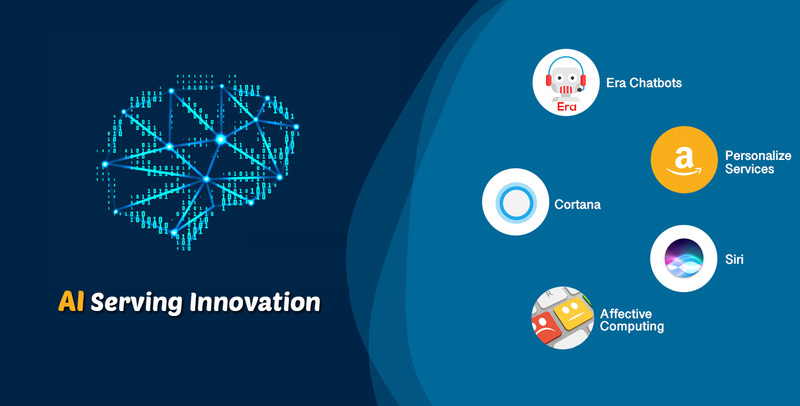 The year 2017 made users busy with Virtual assistants, however, the greatest achievement was witnessed with taking bots - Siri and Cortana emerged as the smart speaker. For instance, blending voice recognition and chatbot technologies was a win-win game, offered in the household-friendly package. Products like Amazon Echo and Google Home treasured 25 million units sale in the US alone in the year 2017 (that was triple the amount of sale the previous year). This showcase a unique avenue for customer service. On the top, the users are making voice purchase using Echo on Amazon - this represents a huge engagement opportunity for retailers to double their ROI. With the start of the year 2018, you might have experienced how the AI systems are becoming more integrated into daily lives. Therefore, companies will look for ways of gaining deeper and deeper insights to explore customer behavior, interest, and demands. The Affective computing - popularly recognized as emotion AI, emphasize to understand human emotions to better streamline the customer engagement process. The growing personalized offering has raised the standard bar for the customer service industry. This has to lead the expectation of customers, they look for instant and frictionless solutions for their queries, therefore, it has become essential for the customer service industry to come up with more realistic and advanced customer experience to hold the customer fleet. Gone are the days, when acceptance was an issue for chatbots and AI, today the scenario is completely changed. Technology is advancing, so as the acceptance by customers. From a couple of years, the Chabot Development Companies have been mushrooming with the growing contingent of customers. Strengthen your customer service business with the AI-powered chatbots. NEXT POST What Factors Affects the Cost of Building A Financial App?